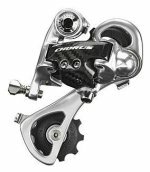 There are 10 and 11 Speed Chorus Derailleurs: The 11 speed rear derailleur has been designed to be more rigid, more precise and faster with a parallelogram of new design with an oversize carbon fibre outer plate. The use of light alloy and composite reduces the weight while maintaining absolute operating precision. The dimensioning precision has eliminated any possible play between the parts right from the beginning. Redesigned parallelogram. Aluminium alloy bodies. Composite outer plate. Pulleys made of Anti-Vibration material.